CITY – GATE of Polish mountains, a passage through which a large part of Poles begins their march towards the beauty and majestic atmosphere of the Tatry Mountains. Traveling from the sea, from Mazury or even from Krakow, they travel miles with memories of incredible views and the power of nature. For many of them, this path is the last element separating them from the longed-for, long-awaited, a few days of respite in the bosom of nature. Tension and longing growing since the last time they left the mountains to culminate with every kilometer approaching the goal – a wonderful city that will meet them for a moment before heading up. 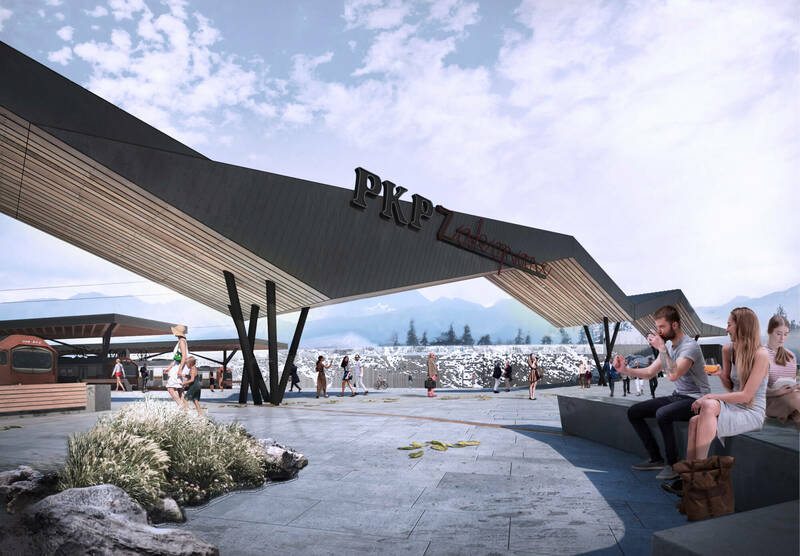 TATRY ENTRANCE, a city where Poles greet the mountains, deserves the right infrastructure, thanks to which it will welcome travelers with dignity. The architecture of the station of this particular city should be the crowning point of the road from the farthest places in Poland and at the same time be the opening, the beginning of a new journey. The main idea of the following concept was the attempt to create a space perfectly complementing the gap between the feelings of increasing tension and longing built on the road and the flow of joy from achieving the goal. 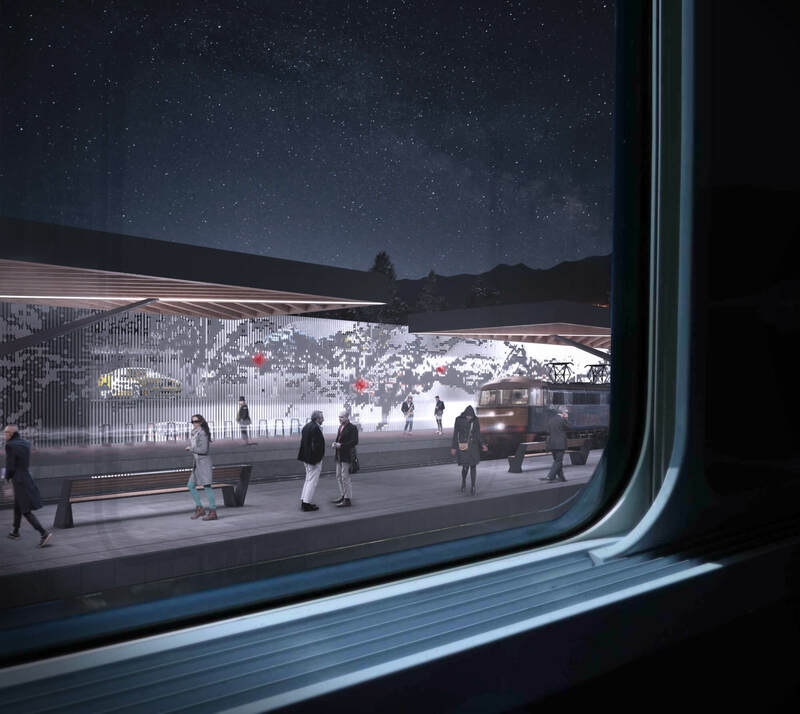 Travelers, reaching the last station, see the newly designed elements of the station through the train windows. 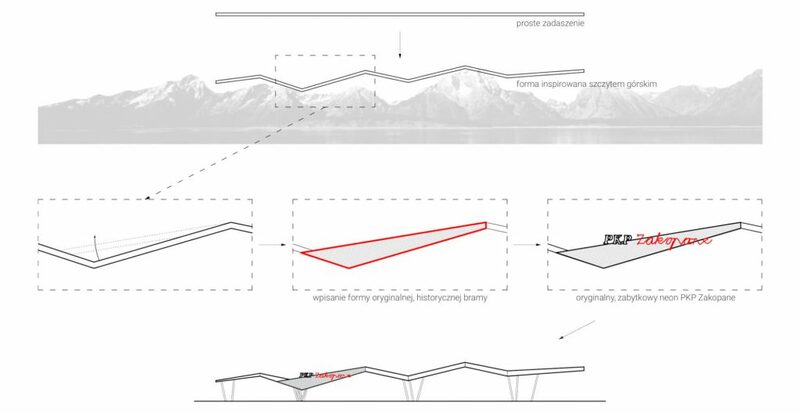 The inspiration to create the facade of the car park building along the tracks was one of the most famous Tatra trails – Orla Perć. The elements of the building’s finish were designed in a way that imitates the topography of this beautiful section of the Polish mountains. 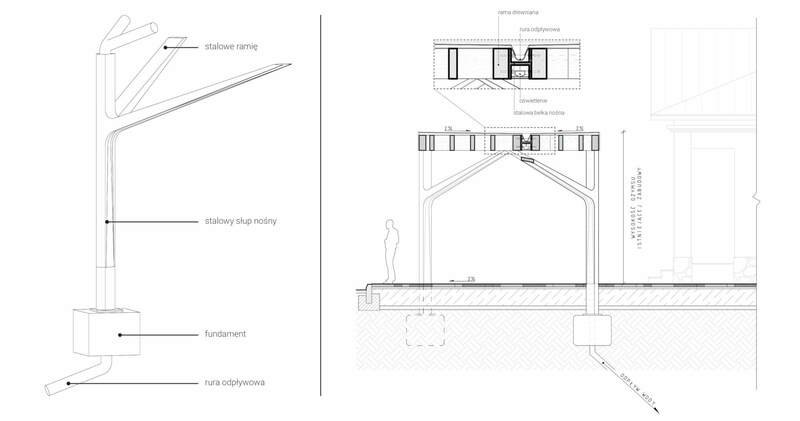 Horizontal proportions of elevations parallel to the platforms make the entrance to the station a metaphor of the first step on the route. Being still on the train, travelers get a taste of what they came for, why they came to the south of Poland – wandering. Passing the next meters of the building, they can catch in the “topographic” façade Zawrat, Kozi Wierch and other important places on the Orla Perć route, which have been highlighted with the help of red LED lamps. A sample of what is awaiting them in a minute will fuel the travelers’ emotions even more, preparing them to cross the gates of Zakopane. After leaving the train, the traveler reveals an ordered space, open towards the city thanks to a gate designed in the form of a roof on narrow, unrestricted columns. 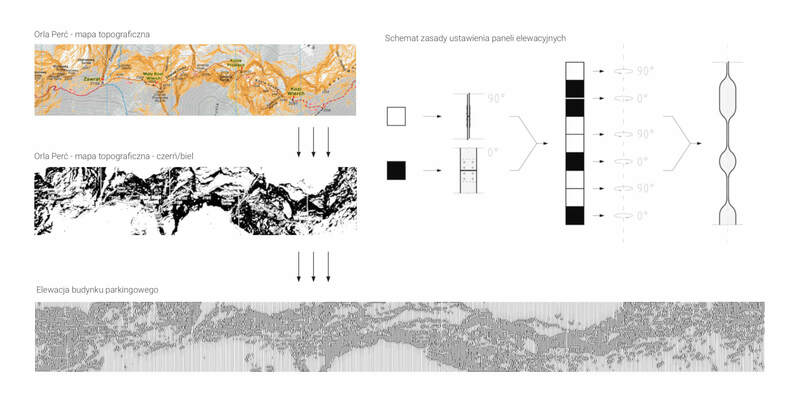 Its shape and refractions perfectly match the mountain climate of the city, and the finishing materials refer directly to the Zakopane architecture. Each of the visitors will definitely notice the historic neon sign – the symbol of the end of the mountain route of the train. A skillful eye will also catch the shape, familiar, triangular form of one of the roofing modules referring to the previous look of the gate, through which the passage began more than one journey. 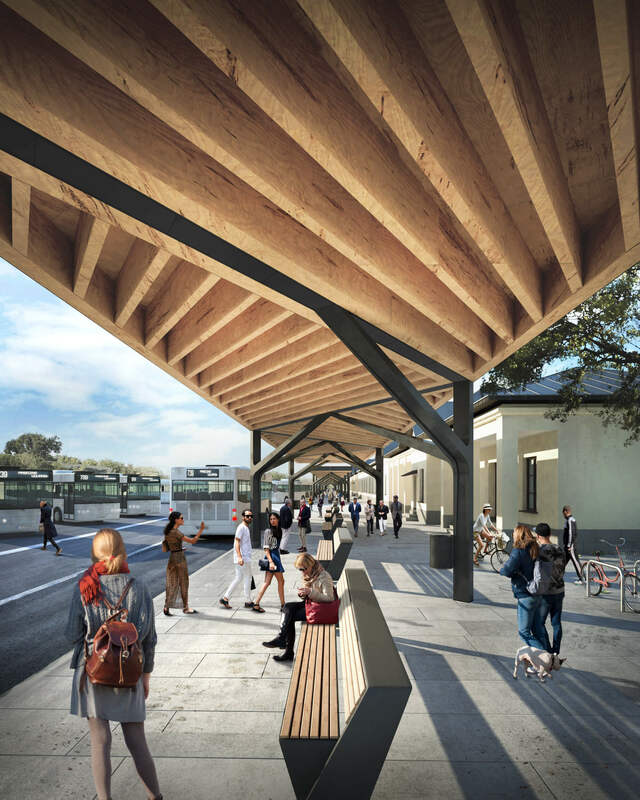 The small architecture of the station and the most numerous of its elements – the roofs of the bus stops were inspired by the characteristic Zakopane style of architecture. As indispensable parts, without which the proper functioning of the entire station would be impossible, they had to meet a number of both functional and aesthetic requirements. 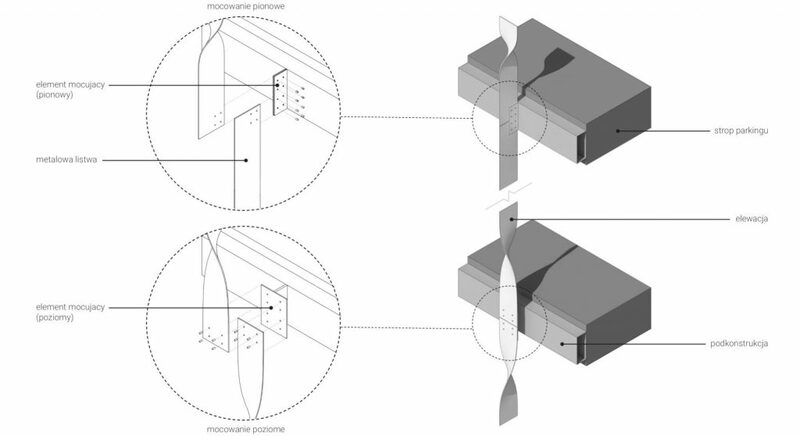 The ideal balance between these factors is achieved by using a simple form that inscribes the historical context of the place with modern shapes, proportions and lines.